Business Rules Management Systems (BRMSs), business rules engines, knowledge management systems, expert systems, predictive analytics systems, and decision management systems are only a few of the terms which are currently used to refer to software packages used to specificy, execute and manage business logic (business rules, decisions / knowledge). However, is each term beign used to refer to a software package with unique features? Very carefully expressed: probably not. A very important question which then immediately arises is: “How can business logic management systems be classified?” This classification can be very important for organizations since it can support them during the selection process of a BRMS. Different classification schemes exist to classify BRMSs. Two commonly used schemes are: 1) a classification regarding the variability of a business rule and 2) a classification regarding the life cycle of a business rule. This article elaborates on the first mentioned classification scheme: the classification regarding the variability of a business rule. 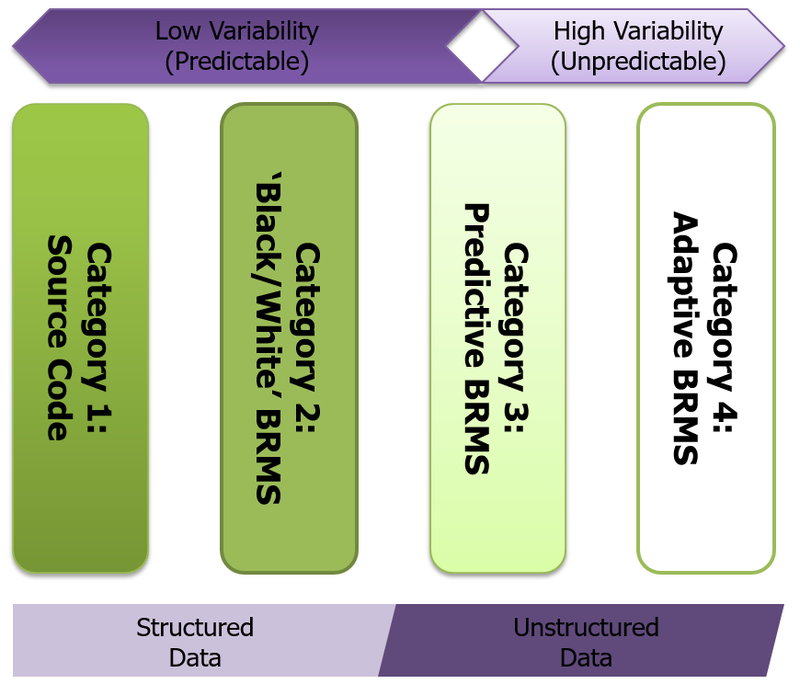 The classification scheme regarding variability divides BRMSs into four categories: 1) source-code, 2) ’black/white’ BRMSs, 3) predictive-BRMSs, and 4) adaptive-BRMSs. This subdivision is made based on the applicability of a BRMS that is determined by the extent to which the variation in the execution of the business rules can be predicted in advance. In other words, certain types of BRMSs are very suitable to apply when all the execution paths of the business rules are known in advance (left side of Figure 1). In contrast, other BRMSs are very suitable when the variation of the execution of the business rules is very high and thus the execution paths cannot be predicted (right side of Figure 1). Based on the predicted degree of variation of the business rules and by means of this classification scheme, an organization can select a software package which is more applicable for their situation (see Figure 1). When all the possible execution scenarios of the business rules can be determined and captured in advance, then an organization can choose to specify their business rules in source code (category 1), for example with C, C#, C++ or Java. Currently, category one is often selected for critical software systems, which can pose a threat for the environment and/or humans. Examples of this type of systems are software systems for nuclear power plants. The second category, black/white BRMSs, distinguishes two types: 1) commercial off-the-shelf software systems (COTS) and 2) specification systems. The first mentioned type, COTS systems, are packages which are described as commercial off-the-shelf software such as: 1) Salesforce and 2) SAP. In these software systems, the facts and associated data models are already defined. In addition, these systems include, in most cases, templates to specify business rules. The templates guide organizations in such a way that they can quickly and simply establish a business rule set that applies to their situation. An example of a business rule template is: “If the order amount is more than € X, than there must be paid in advance”. In this example, the € amount is a variable X that can be filled in. Furthermore, these software systems offer the ability to specify business rules based on predefined fact types for which data is stored in the software system. Examples of the second type black/white BRMSs, specification systems, are: Blueriq, Rule Management Suite and the Pega Systems Suite. In contrast to the first type, the facts, fact models, and business rules have to be defined from scratch in these specification systems. However, for this specification, the business rule modeler is sometimes supported by the system by means of providing predefined templates for specific business rules, for example a template for classification business rules or calculation business rules. But how do you make the choice between the management of your business rules in a type 1 or in a type 2 black/white BRMS? Type 1, COTS, offers predefined sets of facts, fact types, and business rule templates which are often based on industrial standards. This means that when an organization wants to comply with the industry standard, choosing a type 1 software system is adequate to meet the requirements of the organization. However, when an organization believes that their way of making decisions (the application of unique business rules) ensures a unique selling point, and in this way constitute a strategic asset, then the business rules need to be specified from scratch. In that case, it is not recommendable to specify the business rules in or according to a type 1 software system (COTS). A better choice is to use a type 2 black/white BRMS: a specification system. The third category are the so-called predictive-BRMSs. A predictive-BRMS offers a combination of static business rules, as defined in a type 2 black/white system, and predictive models. The predictive models are used for decisions of which not every possible execution scenario is predictable in advance. Examples of such decisions are: “The chance that someone will completely repay his/her loan” or “fraud and risk classifications.” The predictive model can be used stand-alone, in combination with other predictive models or with static business rules (business rule models). In combination with static business rule models, two different applications are possible. The first application is to use the values or percentages derived from a predictive model, as input for a static model. The second application is to determine, based on static business rules, which predictive model should be selected. The fourth category BRMSs are adaptive-BRMSs, currently also often referred to as cognitive systems. 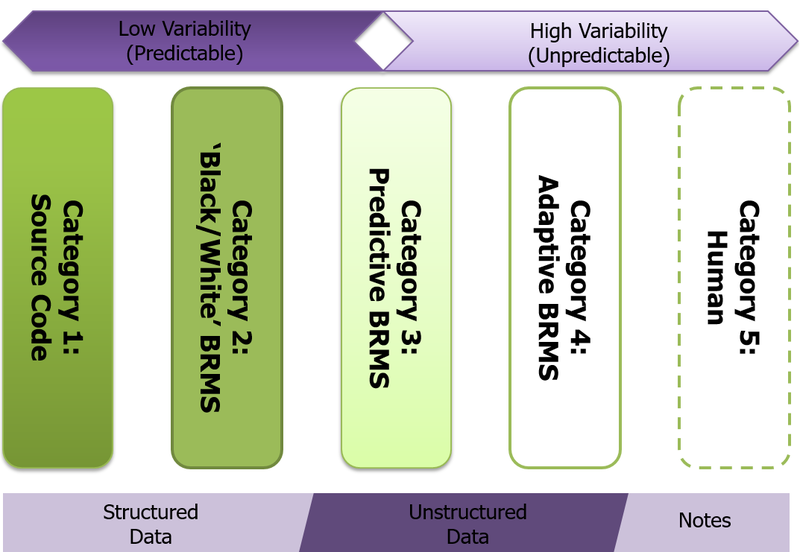 The difference between predictive-BRMSs and adaptive-BRMSs is that predictive-BRMSs have relatively limited options with regard to predictive models and that adaptive-BRMSs supports the use of both predictive and prescriptive models. To realize this, adaptive-BRMSs use, beside predictive analytics techniques, also text-mining techniques and different machine learning techniques. The aim of applying different techniques in an adaptive-BRMS is to simulate the human brain or part of the human brain. Adaptive-BRMSs do not only create the business rules itself, but also execute them in situations where it thinks that they are applicable. A final remark is that an adaptive-BRMS is usually a combination of software packages and it is not a single integrated package. Beside the above mentioned software systems, a fifth BRMS-category can be distinguished, namely: “the human”. The choice between ‘deploying’ a human or a machine usually depends on the frequency in which the business rules will change and the frequency in which the business rules will be executed. When the business rules are unique for each situation or when the business rules are only executed once or twice a year, then the choice to ‘deploy’ a human instead of a software system can be valid. In contrast, some organizations believe that in some cases people can make better decisions than automated systems. Solely taking into account this philosophy can lead to a not properly considered choice for letting a human act as system. With the rise of increasingly sophisticated adaptive-BRMS solutions, of which OPEN AI is an example, machines more and more often defeat humans in decision-making. In summary, it is advisable to make a thorough assessment of whether it is more beneficial in terms of costs to ‘deploy’ a machine or a human to execute the business rules.